A little late in posting . I received galleys for The Better Part of Darkness last week. 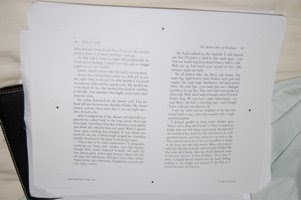 Galleys are a bit mysterious because they can come in different forms -- on regular sized paper, but sized down in the center to reflect the size and font of your book, or printed in landscape form with two paperback book-sized pages on each sheet (as mine is done), or galleys can come as a bound book with no cover image, or with a cover image. But the goal here is to check for grammar, typos, inconsistencies, anything that was missed in the copy edit. Galleys kind of drive home how important those revisions and copy edits are. Copy edits are your chance to dig in and fix, to rewrite if necessary. Once galleys arrive, your opportunity to tear things apart and rewrite is pretty much gone. (Unless, of course, you catch some gigantic plot hole that needs addressing). But, at this stage, rewriting in galleys will cause your editor a lot of extra work. Not good. So how do I fix any mistakes I find in the galleys? Just like I did in the copy edits. Mark them with a pencil or pen, or some folks like to create a new document and just write a list of page numbers and the mistakes and then turn that in. Different strokes, for different folks. My editor is cool with however I want to do it, which is awesome. It's easier for me to just mark the actual page and send whatever pages I marked back to Pocket. Cool, never even knew that existed! Consider me educated! That's very cool. I never knew you got a second pass at galleys and the differences between copy edits and galleys. Are ARCs just one step further along? Or can they be the same as a galley? Either way, very awesome that you're so close to seeing that book on shelves! Congrats!! Here I thought I was one of the last to do edits with pen and paper. thanks for the education. Found your blog through Colleen's blog. Congrats on your debut novel-- must be exciting as November nears! I love how you are sharing the process. Opening the ARCs must have been an incredible feeling!